Home / Uncategorised / Rock & Ruddle : It’s personal. Rock & Ruddle offers unique and gorgeous personalised hairbrushes. Our company was launched in 2012 and has since become a leader in offering this lovely gift item. We also offer a range of wonderful non personalised hairbrushes. 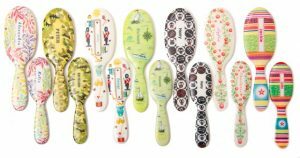 Our personalised hairbrush range its available from our website and offers eight tempting designs. There is a design for every taste created by talented artist Clare Mackie. You will find a myriad of choice from delicate feminine roses to bright and vibrant geometric lines to sailing boats or camouflage. Simply enter your name on your chosen design on our website and your hairbrush will be individually manufactured (the name and design will not wear way over time or with use) and delivered within 14 days. 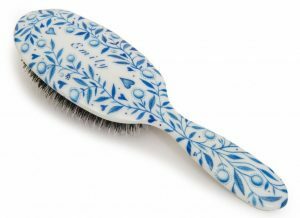 There is a choice of a small size hairbrush which is ideal for handbags and sports bags or a large hairbrush which is luxurious to enjoy in the comfort of your home. Our customers also have a choice of three bristle types. Our natural bristles make our hairbrushes comfortable to use (no pulling or pain) and condition your hair by spreading the natural oils from your scalp throughout your hair making it glossy and supple. 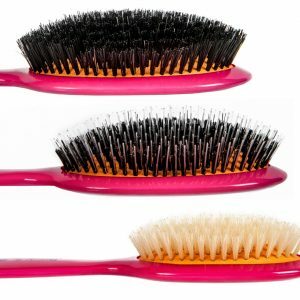 We offer mixed bristles with a nylon tip in each bristle bundle which is ideal for detangling and conditioning normal to thick hair. This is our best selling bristle pad type. For those with fine hair or sensitive scalp we offer a 100% pure natural bristle hairbrush. Finally for our youngest customers we offer a lovely very soft white natural bristle hairbrush just in our small size brush. This bristle type is ideal for baby’s first hair and up to the age of around two years. Treat yourself or gift a beautiful personalised Rock & Ruddle hairbrush to a special person. A gift that will last and be loved.